On Friday afternoon, the Portland Bureau of Transportation (PBOT) announced that Alta Bicycle Share had won the contract to operate the Portland Bike Share system. Given Alta’s Portland headquarters, their success in nabbing major bike share projects around the country, and Birk’s own close connections with the City of Portland (she used to run the City’s bike program and her other company Alta Planning + Design is a frequent contractor), the decision wasn’t a huge surprise. But while Birk’s company had a huge head start in the race for this contract, PBOT must have also been aware of the flood of headlines about software problems and delays that have dogged Alta Bicycle Share for the past few months. How does it feel to have finally been awarded the contract? Excellent! It’s been hard work to get to this point. We’ve been working on various aspects of a successful Portland bid for a year or so. Of course, this is just the first step. We look forward to negotiating the contract, securing sponsorship, and working out a myriad of details to launch and operate the system. Given that you live in Portland and you used to work for PBOT, how will this project feel different to you than all the others you’re working on? I’ve been working on various aspects of sustainable transportation in Portland for close to 20 years. It makes me ridiculously happy how many more people cycle now (than used to), how extensive our network (although certainly we have a long way to go), and how many kids think it’s just normal to get around by bike at least some of the time. Our Portland-based staff all ride as normal parts of their daily life. We all feel that it’s a thrill and honor to work hand-in-hand with the City and community on this. 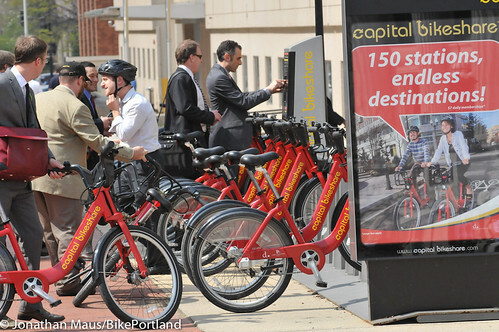 >Birk says DC’s Capital Bikeshare is a good model for Portland. Is there a bike share system in existence in a city you feel makes a good comparison/model for us? Capital Bike Share (DC-area) for its high profile visibility and density of stations (I rode on that system back in March). Minneapolis [Nice Ride] is perhaps the closest comparison in terms of an already bike-friendly City with bike share. At the same time, Portland’s system will be tailored to our unique land-use patterns, demographics, and various other aspects. Alta Bicycle Share has had some tough headlines in recent months: There’s the allegations of unfair bid process in Chicago, the delays in NYC, and so on… Do you fell you can work with a clear focus on the Portland project? And can you update us on those issues? Of course! In NYC, software testing is going well, and we’re on schedule for the March launch. In Chicago, the delay is due to a number of issues unrelated to us. We are ready to go. As to the protest, we stand by having won fair and square in a highly competitive process. We’re also working on systems in the Bay Area and Vancouver BC, as well as a couple of smaller cities. And we’re expanding the systems in the DC and Boston areas and solidifying the just-launched system in Chattanooga TN. Capital Bike Share just logged its 3,000,000th trip! The experience in North America vis-à-vis bike share is very new. The key thing to remember is that we launch and operate large-scale systems that are meant to be long-lasting. It’s like starting a new TriMet in numerous cities, each of which is doing it differently. To me, having worked in and for government for two decades, it’s not surprising that things have taken longer than initially envisioned. Officials tend to publicly pick launch dates before having everything worked through. For example, funding issues — often a mix of federal and local dollars and sponsorship — tend to create a longer timeframe than officials (and the public) initially hope for. Capital Bike Share launched quickly because they had all government money and DC as a unique sovereign entity had complete control of the funding. The other cities don’t have that; most are using federal dollars that flow through state DOTs and/or regional agencies –with very complex and challenging bureaucratic requirements – AND they are raising private funds as well. In NYC, which wanted a completely privately financed system, we had to secure not just an underwriting sponsor but a large bank loan. It’s awesome that we were able to do this in such a short amount of time, as anyone involved in fundraising will tell you, and a real testament to the dedication and brilliance of Janette Sadik-Khan and ABS [Alta Bicycle Share] President Alison Cohen. Then, besides sorting out funding issues, you also have to do site plans and secure permits, hire staff, buy equipment, and work though a long list of hundreds of other details. In other words, short delays are not surprising given the complexity of issues. We try to take a long view, and believe that it’s important to get it right on the front end in order to ensure long-term success. I wrote this statement about 4 years ago as the volunteer co-chair of the citizens’ committee. Since that time, bike share has taken off in a big way. Back then, to be honest, I was skeptical…my feeling was that developing a world-class bikeway network was arguably a higher priority for Portland than bike share. Since then, my mind has been changed. Bike share is the solution that will allow us to fulfill the 2030 vision. I say this based on experience gained by launching and operating the nation’s largest bike share systems in DC & Boston, and by our partner PBSC in Montreal, Toronto, and London. Add in the experience of the hundreds of cities in Europe, China, Mexico, and beyond, and it’s clear: done right, bike share is a game changer. A lot of cities have done bike share a small scale – a few stations here and there. Nice, but not at a scale to fulfill its potential. Done right – with the right planning, scale, funding, equipment, and operator – and virtually overnight you create a long-lasting, win-win healthy, sustainable transportation solution. This has been our experience. Can you offer any estimation of when we can expect bike share to be on the ground? Certainly we are hopeful for next Spring or Summer. As soon as we are able to negotiate a contract, we’ll be working with our non-profit partner – Portland Bike Share Inc – to secure private sector system sponsors. We’d appreciate any ideas, contacts, or leads in this vein.